A "vulnerable" inmate died after a series of failures at the jail she was in, an inquest jury has ruled. 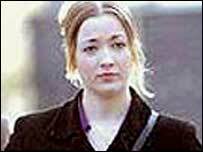 Sarah Campbell, 18, took an overdose of anti-depressants at HMP Styal, in Cheshire, in January 2003. The teenager, who had a history of drug abuse, self harm and mental problems, had been convicted of manslaughter and sentenced to three years in jail. In a "narrative conclusion" the jury said the prison was responsible for a "failure of duty of care". Campbell smuggled the prescription drugs into the prison by placing them in a condom inside her body, the Warrington inquest was told. She was placed in a segregation unit at the all-female prison, where she told a medic she had just taken a large quantity of the pills before dying later that night in hospital. Their conclusion added: "There was more emphasis placed on auditing rather than prisoner's welfare." Cheshire coroner, Nicholas Rheinberg, said he agreed with many of the concerns raised. He said he planned to write to the Director General of the Prison Service and copy the letter to the Prisons Minister, Paul Goggins. Campbell's mother, Pauline, said her daughter had been "the victim of a brutal regime". "Women's prisons are understaffed, overcrowded and the staff not trained to deal with prisoners who have mental health problems," she said. Deborah Coles, co-director of the pressure group Inquest, which investigates deaths in custody, said: "This is a damning indictment of the failure of Styal Prison to protect the life of an extremely vulnerable young woman. "The Prison Service should hang its head in shame in its failure to act on the concerns raised by the Inspectorate of Prisons back in 2002." Campbell was the third of six women to apparently take their own lives at HMP Styal, over a 12-month period from August 2002. The Prison Service said in a statement that it recognised there were "significant problems" to address at HMP Styal, but it had endeavoured to improve the situation at the prison. It added there were "lessons to learn" which would "improve things further".